You are currently browsing articles tagged cognac. I asked Francois Bernard, who works for a company that makes Île de Ré cognac, what the story was with Pineau des Charentes, a rather hideous local aperitif made from a blend of unfermented grape must and cognac. He gave me that little French shrug, which means either how should I know or why do you ask such a stupid question, depending on who’s doing the shrugging, and said it happened back in the 16th century when Henry IV was on the throne. I’m not buying it. I mean, were Oreos invented when a baker accidentally stacked a chocolate wafer on top of a spoonful of vanilla frosting? Did we get Rice Krispies when W.K. Kellogg accidentally shot rice out of a canon in the 1920s? Maybe. But you’re missing my point. Which is that just about every odd food or drink you can think of was “accidentally” invented when someone mixed something with something else. But I don’t think this was an accident. Think about it. Can you really imagine a winemaker accidentally pouring grape must into a barrel full of cognac? No way. Anyway, every French person who vacations on Île de Ré drinks Pineau while they’re here, usually on the rocks but sometimes in a cocktail mixed with a little lemon juice. Francois says he keeps a bottle in the freezer and it gets so cold that it’s like syrup. I tried it and it tasted like all cognac cocktails to me. Yucky. 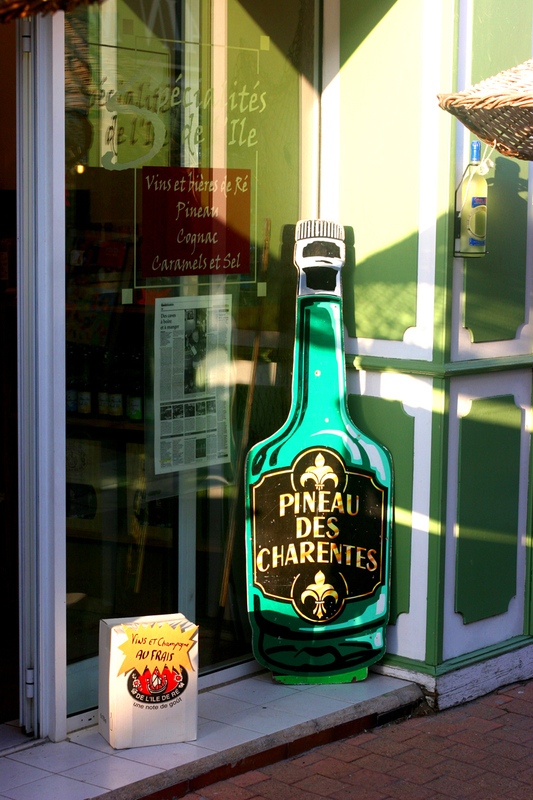 All the little wine shops on the island make a big deal out of carrying Pineau des Charentes. And I imagine every one buys a bottle to take home. And then it sits there, in their liquor cabinet, getting dusty. Some liquors—ouzo, pisco, mescal—don’t travel well. Unless you’re Anthony Bourdain. Who, they say, is a junkie for duck liver and strange liquor. I’d love to see what’s in his liquor cabinet.